Hello Friends, i am Sharing Top Important App For Refer and Earn Like Peppertap Earn From Grocery, Fruits and Vegetables, Ola Cabs Earn Form Rides, Taskubcks Earn From Recharge, Paytm Wallet, Mobikwik Wallet etc..
Peppertap Refer and Earn Refer your friends to use your referral code & get free 100 Rs pepper cash. Referred friend will get Rs 150 Off on their first order. You can earn upto Rs 2500 pepper cash from this peppertap referral program. Here you will see your referral code. This trick is expired now we have just shown for knowledge purpose. There are two more trick for how to generate own referral code for peppertap. This is Now Most Trusted and Working Trick To Get Your Own Peppertap Referral Code. Peppertap Fresh Referral Promo Code Will Be Generate Within 2 or 3 Days. Just Follow Step Below And Start The Loot. Now Complete Your Order and Wait For 2 or 3 Days. Register using your email ,full name and mobile no. Remember you will get 200 Rs wallet credit only when you use this code. Refer your friends and when they take their first ride on ola you will also get Rs 200 Ola Cabs Ride Coupon in Ola Cabs Offers & Ride Section You will see. Enjoy your 200 Rs Free Ride Coupon in your account for free. Uber is an international online taxi booking service. You can travel anywhere within your city using their wide range of cabs. In this post we are going to share some cool information about Uber referral program. You can earn free rides worth 250 rs from this “refer a friend” type promotion. Click here to download uber android app from play store. Register new account by filling name, mobile number & password. It will ask : How would you like to pay? Choose any option from cash, paytm wallet or debit card. Open left sidebar and click on “promotions” tab. Congratulations! Now you have got credits worth 250 Rs. Here comes the main part! Click on “free rides” section and copy down your unique referral code. Whenever friend joins uber and uses your code, both of you will get 250 Rs. How to redeem uber free ride coupons? Link your paytm account with uber and make sure that you have at least 250 rs in it. While booking ride, 250 rs coupon will be applied automatically. You will get free km till 250 rs are consumed and after that it will deduct money from paytm wallet as per the base plan. That’s all! If your ride amount falls below 250, there’s no need to pay driver. Tell him that you have already made an online payment. If he asks to pay, just open your gmail and show him the receipt of your booking. Get Rs 30 or more free recharge from mcent simply for downloading apps and get unlimited free recharge for referring friends to mcent. For earning Rs 30 per friend Collect your Referral link from right side. By this your friend also get recharge and you get rs 30. Your Friend will also get Rs 20 Extra PayTM Cash, Start Inviting! 4] Very Important Use code X9SXUACin empty space and hit “submit” button. Wohoo! Now you will get 100 Rs instantly in the wallet which can be redeemed against further ticket bookings. 5] Now, make your first transaction in order to receive your own referral code. Booking value must be more than or equal to 100 Rs. 7] You can earn maximum of 1500 Rs per account through this offer which will be credited to your wallet instantly. 5] Wohoo! Now you will get your unique code instantly!! 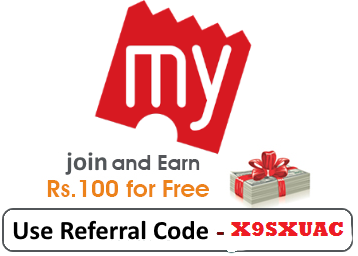 Myntra Referral Code : Myntra Referral Registration Code : Free Rs.100 Credit : Free Rs.100 Credit Refer Code : I have a Referral Registration Code : Myntra is now running Refer & Earn program where you will get Rs.100 Myntra credit once you download Myntra App using friend’s invitation link and you can also earn by referring your friends. Your friend will immediately earn Rs.100 Myntra cash just after sign up and once he/she purchase anything, then you will also get Rs.100 credit, so its a win win game for both. on Myntra App and get Points worth Rs. 100. Download the app using – http://mynt.to/cZjjC – You can also refer more friends and get rewarded up to Rs. 2000.Get the best of fashion at your finger tips, don’t wait download now. Open App and skip the intro pages. Now you see the account creation Page Here click I have Referral Register code Box. Now create account By any availble social plugin or new email. Bingo ! After successful signup you’ll get Rs100 under rewards section(Refer & earn) Tab. Now you can use This amount for shopping their is No minimum purchase required. 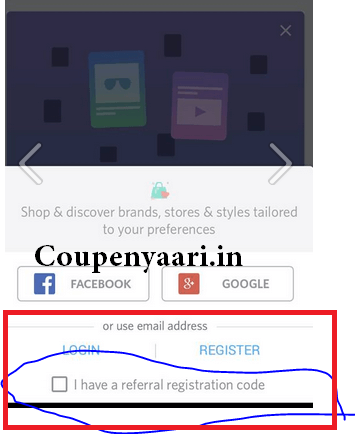 So you have many friends and want to earn more credits.So here it is full steps How just follow the procedure to get Up to maximum Rs 2000 Myntra Credits. Go to Myntra app menu left side. Here you see Refer & Get Reward Section open it. Now you see your special code ,Just copy it. Now just ask your friend to download the myntra app and ask to enter your referral code like you do. As your friend register with your code you Get Rs 100 credits and your friend also Get Rs 100. So do’t be late start sharing. You can earn maximum Rs 2000 only. 5. Finally go to menu Button [Just beside search bar] and click “Refer & Get Rewards” options to refer your friends. Now to earn unlimited Myntra cash , the refer person has to buy something and in Rs 100 , its very difficult to find anything on Myntra. So here i will tell you some products you can buy in Myntra in Rs 100.If you are Men you can Go for Hanes Underwear whose Price is Rs 97 and its final cost will be Rs 102 including Vat and shipping. For Men you can also Go for ETC belts which cost Rs 99 in Accessories. Men can also chose from Personal grooming>> Hair and Body care, there are 2-3 products under Rs 100 range. Girls Can Go to Women >.Accessories>>Hair Accessories and can buy Hair clips in Rs 97.
pay small amount of rs 5-10 that is negligible. Best product to buy from Mynta under Rs 100 is Oxyglow Lip Balm that cost Rs 75 only. You can also buy Banjaras Face wash, Banjaras Heena in Rs 100 from Myntra. Terms & Conditions – When your friend makes his/her first transaction on the Myntra App, you will receive Myntra points worth Rs.100 within 24 hours of order placement. Maximum amount to earn through Refer & earn program is Rs.2000. Ziffi App is a new app available for few metro cities like Mumbai, Delhi, Bangalore and Hyderabad where you can enjoy services like Salons & Spas, Doctors and Diagnostics. Ziffi.com is an online search and appointment booking service in the health & wellness space. It provides people free of charge search and booking appointments with salons/spas, doctors and diagnostic centers headquartered in Mumbai. It is currently operational in Mumbai, Delhi-NCR, Hyderabad and Bangalore. The company was founded by Shantanu Jha, Anshuman Pandey, Pushkar Soni and Keerthi Kiran Chennupati, after Jha realised there was no accurate or reliable information about doctors. It subsequently expanded to include information about pathologists and beauty spas. The name Ziffi is derived from the phrase “in a jiffy” meaning in a fraction of second. The business covers 4000 salon & spas 20,000 doctors and 9,000 diagnostic centres across four cities. The total number of appointments booked through the portal stands more than 26 lakh. Book appointments based on your schedule. instead of waiting at the salon. Book without making any phone calls. comes preloaded with Rs. 100. Cancel and reschedule at no cost. Amazing package deals at salons and spas. Easily keep track of earnings and expenses.